Egypt’s President Abdel-Fattah El-Sisi denounced “any cowardly terror attack against humanity” and called for a minute’s silence at the opening of an event in Aswan on Saturday, to mark the mass shootings at two New Zealand mosques the day before. The attacks killed 49 people, including four Egyptians. 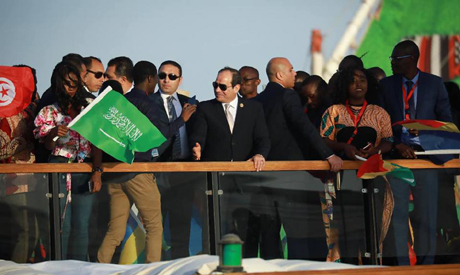 “We are against all violence, we are against all terrorism,” El-Sisi said in an address to an event held on the sidelines of the Arab and African Youth Platform in Aswan to celebrate the country's 2019 chairmanship of African Union. During his speech, El-Sisi welcomed attendees to Egypt, which he said is a meeting point between the west and east, and the south and north. The Arab and African Youth Platform, which is running from 16 to 18 March, is being held as part of the recommendations of last year’s World Youth Forum. The platform will focus on a number of issues of interest to Arab and African youth, in light of Egypt’s chairmanship of the African Union. It will include sessions, workshops, and roundtables with youth leaders and decision makers in an open dialogue.